1. Login to the LSUOnline site using your LSU username and password. 2. The LSUOnline homepage contains multiple useful links that can be used to for educational purposes. These links include: University Resources, Academic Support, My learner Concierge. You can click on the link that you need to access. 3. There is also a My Courses section of the homepage where the courses that you are involved in are listed. These courses can be opened here, or you can also click the My Courses button in the top right corner of the page. 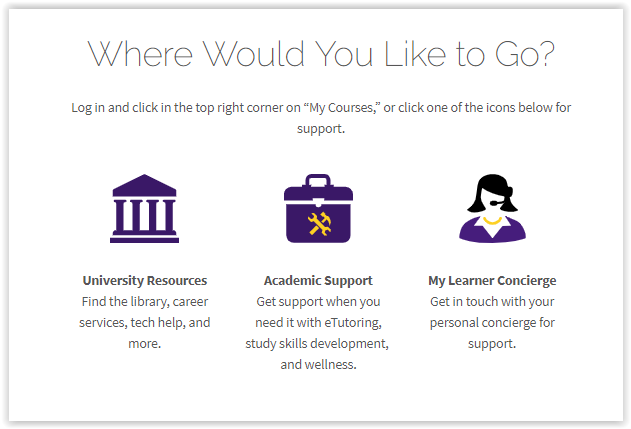 The My Courses button in the top right corner of the page will open a new window that offers a different view of the courses. 4. Click on the course that you want to open.